The electrified lines in Renfe suffered an important dysfunction in the 50s and 60s in full development of the General Plan of Reconstruction (PGR). Both principal private companies, Norte and MZA were trying to use totally different and incompatible tensions between if. In the projects one was not expecting to create big electrified nets, maximum was considered profitable to electrify zones of influence of the surroundings of Madrid, of Barcelona and some of the principal steps of mountain. The principal weight of the traction would continue being of the steam locomotive. In the half of the XXth century the great development of the locomotive was not waiting for diesel. For this one and other motives, Renfe's electrifications they continued the guidelines initiated in the years previous to the war with the exception of the electrifications of the Castilian plateau in the lines of connection to Galicia, Asturias and Cantabria, the surroundings of Barcelona and also in direction Andalusia, with tension to 3.000 volts. In the first chapter of this work already we detail this situation. The units of Swiss origin that already we have seen in this first part could not circulate suitably in the lines to 1.500 volts. The recent electrification of the lines of Madrid to Avila and Segovia, fruit of contracts and works interrupted in full Civil war was not allowing a rapid conversion 3.000 volts. For this motive one chose to develop and acquire suitable material to be employed at both tensions. In the first moment it was a question of units of train for the surroundings of Madrid and this way they were designed. But these new trains, proceeding from a new technology applied in Europe, offered a few presentations that were allowing them to be employed so much at services of surroundings as in diurnal of certain distance. These new trains registered in the series 900, are the first protagonists of this book. Simultaneously, in the Decennial Plan of Modernization that was designed in the sixties, one was trying to raise the level of rapidity and comfort of the services in diurnal in agreement to the standards of the TAF of the fifties. There are born like that the TER, which simplified the exploitation of the diurnal services up to the point that was the prototype of the new electrical diurnal trains of long billiard cue and a half distance, initially for the services between Madrid, Asturias, Cantabria and the Basque Country. These new electrical units bitensión were named Electrotrén. 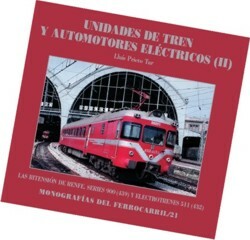 The units and the series 900 were sent to destinies increasingly removed from Madrid to realize services of regional and inter-city type up to his total retreat in the nineties whereas the units Electrotrén realized services of all kinds, from length crossed even regional, activity the latter in that still they find active, and given the recent remodelings that have received, it seems that they will be in service some years more. Author: Lluís Prieto i Tur. Size: 22 X 20,5 X 1 cm.